Weekend Reading: Seven of Pentacles from the Victorian Romantic. It seems like we've been getting this message a lot on the weekends—enjoy yourself. Traditionally this card speaks of the hard work being done and waiting to see what comes of it. 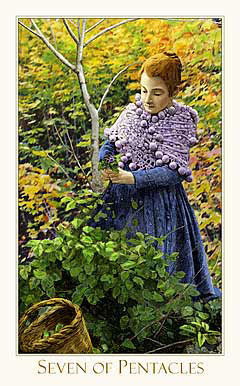 But this version shows a woman lost in the moment as she gathers blooms and tends to the abundance she's created. So really just enjoy your weekend. You earned it.